Designed to attract visitors of all age groups, this museum is dedicated to preserving the history of World War II. 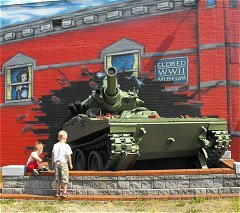 An M551 Sheridan tank seems to burst through the wall of the museum. This museum features spectacular exhibits, award-winning video, and a large research library. Highlights include a M255 tank, a working submarine periscope, and tank-mountain where visitors can operate radio controlled tanks and compete to conquer the fortifications. During World War II, Eldred was the site of a British and American munitions plant that produced mortar, fuses and over eight million bombs. Fifteen hundred people worked there, 24 hours a day from January 1942 to May 1945, supporting the war effort. 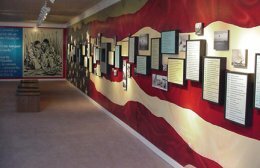 The Eldred WWII Museum was opened on Memorial Day in 1996. Call for details concerning the annual town-wide Memorial Day Celebration, and special programs at the museum. Groups Welcome with prior arrangement.To book your school, organization or motorcoach tour call 814-225-2220 and inquire about programs and available times.